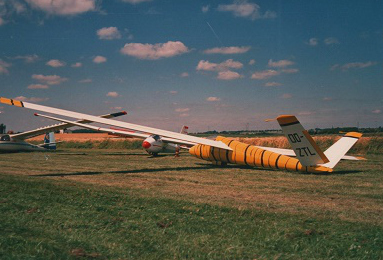 The Austria glider was commissioned by the Österreichischer Aeroclub to compete in the 1960 OSTIV competition for a Standard class sailplane ; competition that it won. The design aims were to produce a glider with a low wing loading and a high lift/drag ratio. To achieve this, the Austria was built primarily of wood with plywood skinning and a glass-fibre nose section and tail cone. The cantilever wings are unusual in having no spars. After the initial production run in Austria, the production was moved to Schempp-Hirth in Germany during 1962 where it was developped with another airfoil. A total of 81 were built. 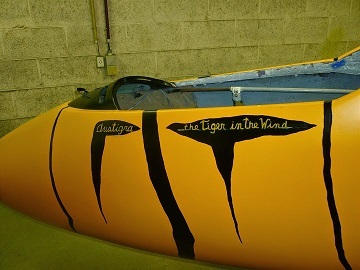 It held the world goal record of 737 km and the world goal-and-return record of 698 km. B.A.P.A. examplar : # 55 built during 1964, it was registered OO-ZTL on 16 april 1965. Its last owner based it at Temploux where it was unfortunately slightly damaged due to a temporary external storage. 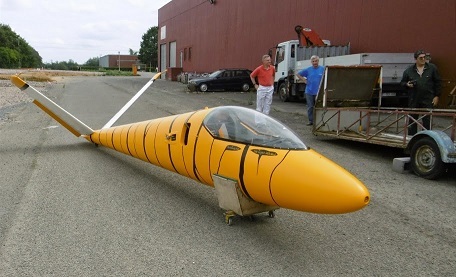 Given by Willy Marrot in october 2013, the fuselage was repainted in its original striking « Austigra in the sky » scheme. The wings need to be restored and the instrument panel is missing.